The Nagaland cabinet at a meeting on Saturday deliberated on the Citizenship (Amendment) Bill, 2016, and resolved to adopt a resolution re-affirming all provisions of Article 371 (A) and to strengthen the implementation of the Inner Line Permit (ILP) as per Bengal Eastern Frontier Regulation, (BEFR) of 1873. This is in reiteration of earlier cabinet decisions on the issue on June 5, 2018 and January 7 this year, a chief minister’s office release said on Sunday evening. The cabinet in Saturday’s meeting also decided to take up the matter in the next session of the Assembly. The decision was taken in view of the passing of the Bill in the Lok Sabha and its “adverse impact” on Nagaland and other northeastern states, the release said. The cabinet also decided to refer the bill to the Standing Committee on Article 371 (A) under Nagaland Legislative Assembly to examine it in its entirety. “The Cabinet was of the unequivocal view that the Citizenship (Amendment) Bill, 2016 is not applicable to Nagaland and we stand protected under the provisions of Article 371 (A) and the Inner Line Permit (ILP) as per Bengal Eastern Frontier Regulation, (BEFR) of 1873, affirmed under Clause 16 of the 16 Point Agreement,” the release said. The state cabinet also decided to further appeal to the Centre to have wider consultations with all the northeastern states to ensure that the rights of the indigenous people are fully protected. 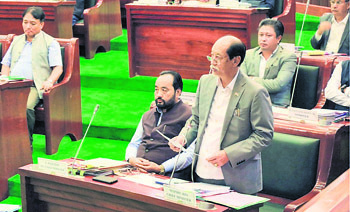 Following Saturday’s cabinet decision, Chief Minister Neiphiu Rio shot off a letter to Union home minister Rajnath Singh conveying the concern and apprehension of people of Nagaland with regard to the Bill, the release said. Rio, in his letter, clearly mentioned that the Bill, even if enacted, will not be applicable to Nagaland in view of the “constitutional ecosystem” contained in Article 371 (A) of the Constitution that guarantees non-interference in the Nagas’ way of life by any parliamentary enactment unless the Nagaland Legislative Assembly by a resolution so decides. “This is necessary to ensure that the historic and unique cultural traditions and customary practices of Nagas are protected and safeguarded for which special constitutional provisions under Article 371 (A) have also been incorporated in the Constitution of India,” the release added.